Although it was generally unremarked at the time, the 10th round of the World Sports-Prototype Championship at Fuji was significant in being the last world championship 1000 kilometre race to be held, ending an era that dates back to 1953 when the FIA announced the World Sportscar Championship for Manufacturers. Typically the series was announced in February, five weeks before the opening round which was the Sebring 12-Hours on March 8! Each race was to cover a minimum of 1000 kilometres (621.38 miles), and the first championship included Sebring, the Mille Miglia, the Le Mans 24 Hours, the Belgian 24 Hours at Spa, the 1000 kilometre race at the Niirburgring (44 laps which took Alberto Ascari and 'Nino' Farina nearly 81/2 hours to accomplish in their Ferrari), the 800-mile Tourist Trophy at Dundrod, and the fiveday, 1900 mile Pan-American road race. 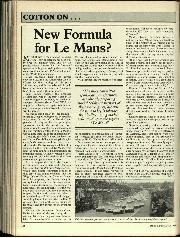 The works Ferrari team narrowly beat Jaguar that year, the British marque winning at Le Mans however, and clearly 1000 kilometres was considered to be the absolute minimum for a decent motor race organised for sports cars, machines which in theory were either developed road cars or prototypes of future catalogue models. By 1959, the end of what might be called the first era which had involved Ferrari, Jaguar, Aston Martin, Mercedes, Lancia, Alfa Romeo, Cunningham and Porsche as potential winners, the world championship was down to merely five events: the Sebring 12 Hours, the 800-kilometre Targa Florio, the Nurburgring 1000 kilometre, the Le Mans 24 Hours and the Tourist Trophy race at Goodwood, extended to 6 Hour duration during which time Stirling Moss, Carroll Shelby and Jack Fairman covered 863 kilometres in their DBR 1 , ensuring that Aston Martin would win the championship. Ferrari dominated the early Sixties, though Ford became an increasingly powerful force as the decade went along; then it was Porsche's turn to reach the forefront as the FIA's new 3-litre/5-litre formula was introduced, at very short notice, in 1968. The abolition of the 5-litre class temporarily swung the spotlight onto Matra, Ferrari and Alfa Romeo in the early 1970s, but from 1976 onwards Porsche became the most eminent make for a full ten years, until the managements of Jaguar and Mercedes decided to re-enter the series. Their reputations had been enhanced considerably 20 years before but now needed polishing, and the 1988 season just completed has provided the public with some marvellous racing, often with merely seconds between the two great marques after 1000 kilometres, or six hours of racing . 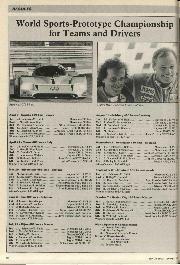 In particular, the 24 Hours of Le Mans was a showcase for sports-prototype racing, less than three minutes separating the Tom Walkinshaw-directed Silk Cut Jaguar of Jan Lammers, Johnny Dumfries and Andy Wallace, and the works Dunlop/Shell Porsche 962C of Hans Stuck, Derek Bell and Klaus Ludwig. 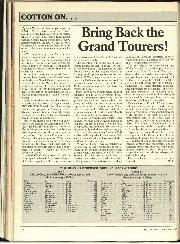 Had the AEG Sauber Mercedes team actually been able to take the start, the '88 contest would have been exceptional, as next year's could be if the private teams of Richard Lloyd, Reinhold Joest, Walter Brun and the Kremer brothers are given all the assistance they need to do a good job. 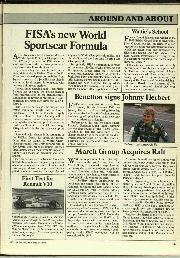 . . there always seems to be one more Le Mans success left in the 962C. Spectators are not expected to remain spellbound throughout a 24-hour race nor even, these days, by a 1000 kilometre event. 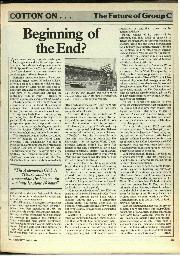 Their threshold of interest is presumed to be much lower than in days of yore, weaned as many of them are on Grands Prix lasting 80 or 90 minutes, and although the so-called 'sprint' races of 360 kilometre distance were introduced as an experiment in 1986, which showed no signs of actually increasing the attendances, the shorter format will become the norm from 1989 onwards. Average distances will be 400 to 500 kilometres and the races will be over in two or three hours, save of course for Le Mans. 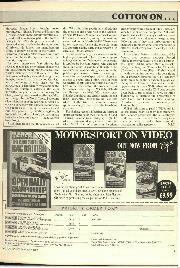 FISA has, in its wisdom, killed off the World and European Touring Car Championships, depriving Ford and BMW of an effective showcase for their products, and the World Sports-Prototype Championship effectively fills that void since the Procar formula, the brainchild of BC Ecclestone and Max Mosley, appealed to no-one except Alfa Romeo's management and has been set aside for the time being. In 1991 the World Sports-Prototype Championship will be open only to manufacturers and teams with 31/2-litre engines at their disposal, engines that resemble Formula One units but will have to be detuned or redesigned, especially for Le Mans. Alain Bertaut, journalist and steward of both the Automobile Club de l'Ouest and FISA, jokes that "of course the Le Mans race will continue as usual, but as a relay. . . every three hours the teams will change the cars!" The tradition of 1000 kilometre events grew quite slowly, the ADAC being the instigator and most loyal supporter of this format, and ironically it was the ADAC that experimented with a new format in September, substituting two 500 kilometre races which fulfilled everyone's worst fears. Jacky Ickx, perhaps the greatest sports car driver of all time, argued passionately for shorter, multiple races (his idea was a race on Saturday afternoon, continued on Sunday morning and concluded on Sunday afternoon) as a means of increasing interest. Inevitably television coverage is the key to increased popularity. 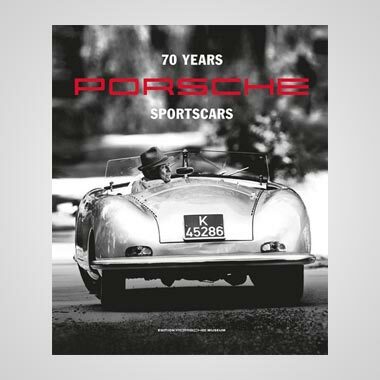 The contests between Jaguar, Porsche and Mercedes have certainly raised the profile of sports car racing and brought more people through the gates, but the regeneration is going too slowly. The gap between Grand Prix racing and every other branch of the sport is far greater than it ought to be, and the astute Mr Ecclestone has seen, in the past season, that a series of predictablc one-sided races can and will seriously diminish public interest. The introduction of the 31/2-litre class straight away is a good move, these cars realistically scaled at 750 kg minimum and not controlled by fuel consumption. Spice Engineering, World Champions in the Group C2 category for the past four seasons and undoubtedly one of the most professional teams in the entire championship, will support the 31/2-litre category straight awav with Cosworth-powered cars, and will he joined in 1990 by Alfa Romeo, followed by Peugeot and a number of other manufacturers which have not yet declared themselves. Mercedes, Jaguar Sport, Porsche, Aston Martin, Audi, Nissan, Toyota and Subaru are all considering the new formula very studiously, and if all were to take part in this form of racing in the 1990s the prospects would be very good indeed, not least for the top echelon of drivers. No longer can manufacturers afford to employ 'sleepers' in their teams — each driver has to be a 'star' who can jump into the car and break the lap record every time around, if required. In recent interviews Max Mosley has revealed that he has by no means abandoned the idea of Procar racing, and that in time the world's manufacturers will come to realise that this was what they wanted all along. 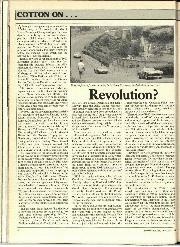 How, though, might Procar (Production Car Racing, a misnomer if ever there was) be introduced at a later date? Cynics among the sports car fraternity entertain the most unworthy thought that since the Touring Car Championship was treated so disgracefully, so too might be the World Sports-Prototype Championship at some later date. After all, once we have the world's major manufacturers building and running two-seater Grand Prix cars powered by 31/2-litre engines, it would take only the stroke of a pen to stipulate lookalike saloon car bodies. . . as voile, you have Procar! I can't help feeling that there is a flaw in all this. Why is it, many people have asked, that the most popular event held at the Nurburgring in 1988 was a 24-hour race for saloon and GT cars, a wonderful, sunny, beer-swilling event held on the Nordschleife? There were far too many cars for the pits available, some 300 appearing at the start, and a crowd well in excess of 100,000 attended. "Grass roots" racing is an anathema to the highly professional rulers of motor sports today, yet if the "fun" of modern motor racing is typified by Mr Ron Dennis, who dare not srnile in victory in case he is thought to be conceited or condescending, a section of the public appears to vote in favour of a less rigid, more informal form of sport which might also manage to be fun. 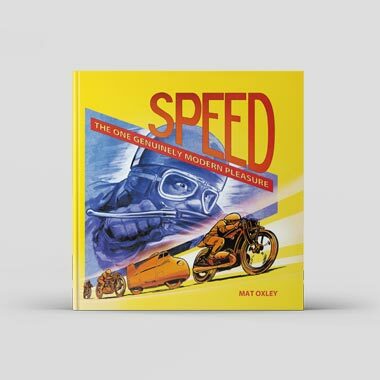 And I think, then, of those wonderful sports car and touring car races held in the 1950s before the Grands Prix at Silverstone, when Jaguar XK120s, Allards and Healeys, then Mark VlIs, Armstrong Siddeley Sapphires and Austin Atlantics had their desperate, tyre-squealing contests which, if the truth be admitted, many spectators enjoyed more than the four-hour main event. For all these reasons, I feel that the future of sports car racing lies in the little-noted "Grand Touring Competition Category" (GTC) which is introduced on January 1, and for which SEFAC Ferrari is preparing Le Mans entries comprising a team ot F40s. There are very few stipulations, except that 200 must have been made for homologation but without costly 'evolutions', they must weigh at least 1000 kg, and if they have turbochargers as standard equipment it must be impossible to alter the boost setting from the cockpit, or by remote control. 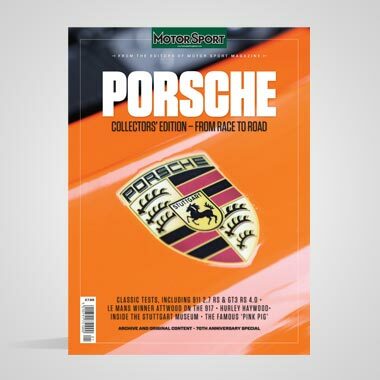 I have argued before, in the context of Le Mans, that contests between Ferrari (although two years ago I cited the Testarossa), Jaguar (XJ-S), Aston Martin, Porsche (959), Lamborghini (Countach), Chevrolet (Corvette) and Lotus (Esprit Turbo) would provide a stunning contest in its own right, and if properly nurtured the GTC category could prove to be the salvation of sports car racing as we know it. Here indeed is the opportunity for Tom Walkinshaw to wheel out those green and white XJ-S beauties, for Peter Falk to run a brace of 959s, for Mike Kimberley to organise the preparation of both Lotus and Corvette entries and for Chrysler to promote its ownership of Lamborghini.